Click here for my first online painting lesson! 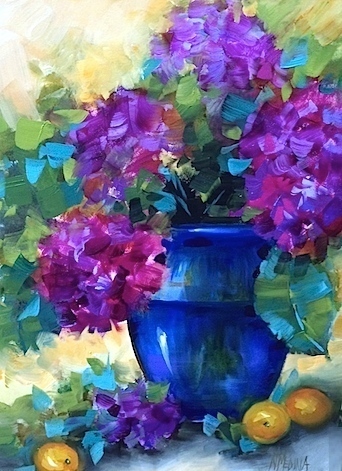 Since my purple brushes were warmed up with irises this week, I dipped into the same warm violet and cool violet piles and created Violet Horizon Hydrangeas, including a cameo appearance in a small way by Big Blue, my blue glass vase. 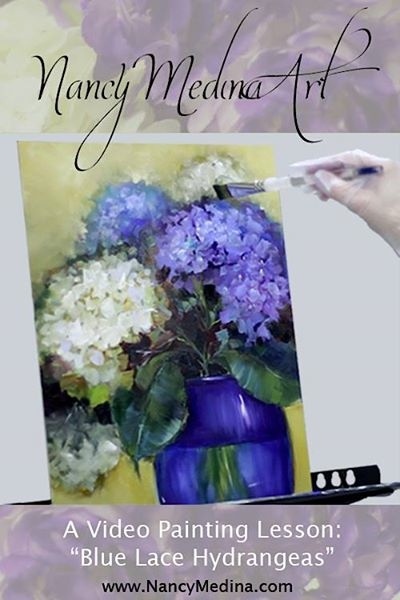 This seems the perfect time to launch my first online painting lesson, Blue Lace Hydrangeas, since we are in our purple zone this week - Click the link below to see the free trailer for my new video, just launched today. Thanks so much to all my flower friends who patiently waited while I fluffed the fluffy parts and polished the sparkley bits! Blue Lace Hydrangeas will be the first in a series of lessons that will be available initially as online classes you can view on your smartphone or computer, and later will also be offered in DVD format. Click here to view my new Blue Lace Hydrangea video!